A fast and lightly armoured vehicle that nonetheless can boast impressive firepower. Ork Mekboyz have the inherent ability to gather together discarded scraps of technology and cobble them together into a functional machine of war, or at least something that looks like one. (Oddly, that's usually all it takes.) The Wartrak is a good example of this; tank treads, assorted engine parts, handlebars, and scraps of armor that have been haphazardly thrown together with spot welds and recycled baling wire is "gud enuff" for the Orks, and after a coat of red paint (to make it fastah) it's driven off into battle to make with the big booms! Ork Wartraks are vital, easily accessible, and highly mobile vehicle support. Their twin Rokkit Launchas provide solid anti-vehicular firepower and their upgradable Bomb Chukka highly disrupts enemy infantry lines. 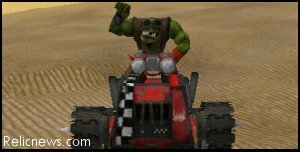 Ork Wartrakks are incredibly swift, beginning at speed 28, faster than jump troops but slightly slower than a Rhino or Predator. Using their Turbo Boost ability, they receive a 50% boost to speed 42, swifter than Land Speeders. With the Speed Boost research at Da Mek Shop, Wartraks achieve equivalent speed to Land Speeders (speed 36) and their Turbo Boost brings them to speed 54, over three times faster than normal foot infantry and more than 50% faster than most main battle tanks. Their Twin Rokkit Launchas deal approximately 160-200 damage per salvo to vehicle_med, the most common vehicle type, every 2.5 seconds. This high volume of fire and consistent damage should be taken into effect. Due to its respectable range and high mobility of the Wartrak, an Ork player can easily dictate how and where to strike vehicles. The Bomb Chukka, after being researched, can turn the Wartrak into a valuable disruption tool. Launching a bomb every two seconds, the Chukka can perpetually keep a squad on its back if several Traks concentrate Chukka fire. It should be noted that the Bomb Chukka deals friendly fire and disruption, so using Chukkas on the same squad a Nob Squad is meleeing is not recommended. Ideally, a mixed force of Wartraks and Wartrukks is fielded. The Wartraks can perform light anti-vehicular and disruption duties while the Wartrukks tear apart any infantry that the Wartrak does not knock over. The Wartrak's speed is increased by 50% for 10 seconds. This weapon does knockback (20-50 force) and friendly fire. The Bomb Chukka upgrade does not replace the Rokkit Launcha|Rokkit Launcha. The Bomb Chukka does friendly fire and knockback (30-40 force) but cannot attack air units. Units hit by the Bomb Chukka have their movement speed halved for 5 s.
Note: In Dark Crusade this research costs 400/400 and takes 96 s.
Boosts the base speed of the Wartrukk and Wartrak by 30% to 46.8 and 36.4 respectively.